This course prepares students in the basics of supply chain and supply chain’s roles within organizations. 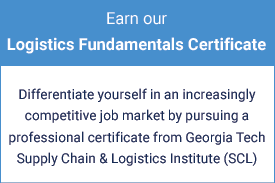 The course includes defining supply chain management and the various domains within supply chain (i.e., customer service, manufacturing and service operations, order management, procurement and supply management, demand planning, inventory management, warehousing operations, and transportation operations). It includes an explanation of how the supply chain supports organizations’ strategic and financial goals. Supply Chain Management Principles is a start anytime, self-paced course consisting of 8 Learning Blocks. 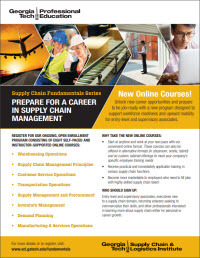 You must take 4 SCF online courses: Required course: Supply Chain Management Principles. Choose 3 SCF courses from the following: Customer Service Operations, Supply Management & Procurement, Demand Planning, or Manufacturing & Service Operations. 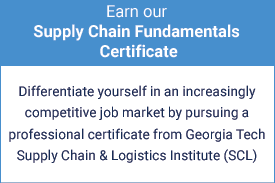 The certificate is designed for those who want a solid understanding of supply chain fundamentals who may be new to certain supply chain domains. The goal of the program is to support workforce readiness and upward mobility for entry-level and supervisory level associates.